We try to highlight some of the positive trends in the region here at KC Economy, but we won’t ignore the bad either. Regional economist Richard Florida recently published a couple of maps that definitely fall into that latter category for Kansas City. If innovation and entrepreneurship is the engine of the economy, then venture capital is the oil. Entrepreneurs need access to capital to try out their businesses. Without capital, entrepreneurs have to forgo their plans, try them at a smaller scale or migrate to where the capital is. All of those scenarios put our regional innovation at a disadvantage. According to these maps, Kansas City just doesn’t compete in terms of venture capital. 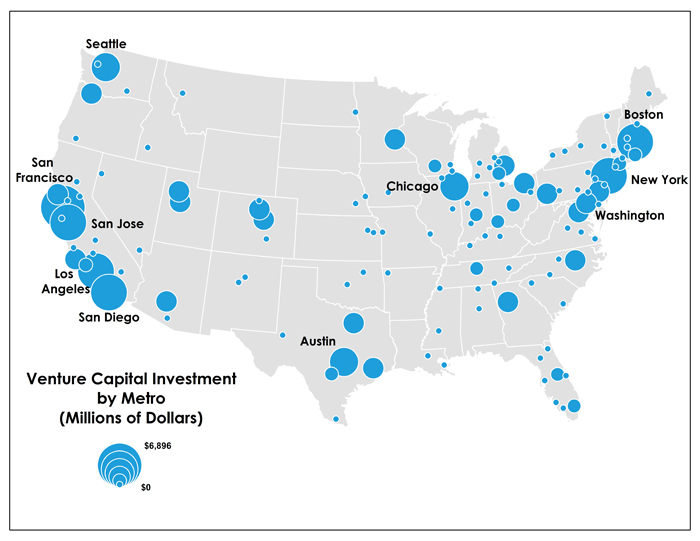 The first map shows the location of venture capital deals by metro area in 2012. The second shows the total value of those deals. In both cases, Kansas City barely registers. So, the real question is why? Are we less entrepreneurial than the rest of the country? Not likely, we have a proud history of entrepreneurship in our community. As we spotlighted last week, Kansas City does well in creating STEM occupations. These are the types of occupations that should foster innovation. Is venture capital simply a coastal phenomenon? Not really. Places like Austin, Denver, Atlanta and Provo show up in the top 20. Other metros like Pittsburgh, Cleveland, Nashville and Detroit also far exceed our level of venture capital. There are well known ties between venture capital and research universities. Could the perceived lack of a large research university in Kansas City keep venture capitalists away? Unfortunately we have more questions than answers at this point. The Florida article is part of an ongoing Atlantic Cities series, so we’ll watch his follow-up articles, which promise to shed some light on the characteristics of metros that are winning the venture capital game. In the meantime, we would love to hear from local venture capitalists, or entrepreneurs who have sought venture capital for a Kansas City area start-up. What was your experience? Is there a real issue here or has it been overblown?